Entering Jiasian was an experience. We could see the aftermath of the August 2009 typhoon along the way. Roads that were once two roads were now condensed to only one serving both ways. You could see where the mudslides hit parts of the town the hardest. There were written signs up along the way warning visitors and passerby’s that they are forbidden to cut down trees and that conservation of the land’s trees was pertinent. 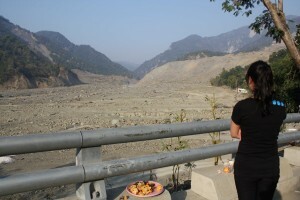 It was because of the cutting of the trees along the side of the mountains that the mudslides occurred in the first place. Hsiao Lin, a town about 30 minutes away from Jiasian was hit the hardest. The entire village was covered. 300+ people were covered and still remain under the dirt/rock rubble – it has become a burial ground. Those that survived have moved into Jiasian and the surrounding areas. I was speaking with the Jiasian Junior High School principal and she was telling me about her experience during the typhoon. Jiasian and Hsiao Lin were not as prepared because those areas were not expected to be hit. More of the northern areas about four to six hours away were preparing for a big downpour and were prepared. Principal Yuan told me that the school used to have about 700 students. After the typhoon she only has 194 students in attendance. The drastic reduction is mainly due to road damage making it very difficult for students to make it to school; as a result, many students need to stay home and help their family make a living. In addition, many were injured and can no longer attend school. The average education level amongst the adult population is elementary school level. Only about ten percent of the kids there end up going to college. The average monthly household income is $300 USD. And most who live there are farmers or land workers. Many of the residents there qualified as low income. In Taiwan, the government has to approve low-income status. Those that received health checks and glasses were all qualified. Walking around town, the local people were pretty excited and interested in why we were there. Although I may have the same color skin and hair, I still look and sound very differently. Even local Taiwan residents such as the optometry student volunteers that helped us with our clinic never go to Jiasian. It was their first time being there as well. While speaking with the residents, they had all heard what we were there to do – provide free eye health exams and new pairs of glasses to those who need them. Looking around town, you don’t see very many locals wearing glasses. It’s not because they don’t need them, it’s because they don’t know that they need them. After their screening, they all had a prescription. They definitely needed a pair of glasses to help them see better and more clearly. When asked how come they don’t wear glasses when they need them, many of the residents said that they couldn’t afford eyewear or they’d have to travel very far to receive eye care. As a result, they don’t see getting eye care as a priority or necessity since most of them are farmers and cooks. If they needed to see clearer they just get closer to the object. Many of the people had not ever had an eye exam. Around town, there are absolutely no optical shops or eye clinics to get a health check. The nearest place to go is about two hours away. And most people have only two means of traveling – by foot or by bike. So many of their prescriptions were -2.50 or even as high as -4.50 with astigmatism! Even with my prescription being as low as a -0.50 with a -0.50 astigmatism, I have difficulty seeing at night. Imagine walking around not being able to see people’s faces or street signs at -2.50 or -4.50? Most of the people are just accustomed to seeing blurry. They have nothing to use as a comparison. Their vision loss is viewed as being completely normal and they simply don’t realize the difference. So, when many of the kids received their new glasses, they were in awe. I remember one kid in particular, as he was the very first kid to receive his new and first pair of glasses; his reaction was, “Wow”. The whole time he kept repeating, “wow”…”wow”. He was very happy and so was I. Experiencing Jiasian for the first time was amazing. Organizing the clinic with Dr. Wu and the Jiasian Junior High School was very exciting and rewarding. We had about 40 volunteers from Central Taiwan Science and Technology University help assist in providing complete eye exams, prescreening for refractive errors, and a prescription to those children and some adults who needed glasses. It was unreal that Kyle and I had made that happen. If we didn’t plan this trip, those kids would not be able to get an eye health exam or complete pair of glasses. 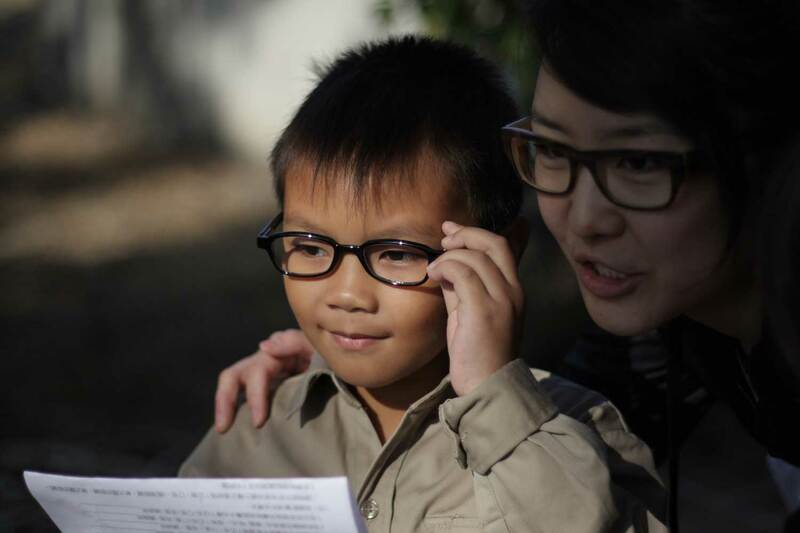 We were able to provide them with new glasses with lenses that were their prescribed prescription! When receiving free eye care, most people receive recycled glasses and lenses that are close to their prescription but not quite exact. We were able to provide these kids with a new and complete pair of glasses that will help them see perfectly. Sometimes recycled glasses with someone else’s prescription is better than being without glasses but can also do some harm because it can cause eye strain or make their vision worse because it is not their prescription. Being able to go across the country to where my family comes from and give my people something so important is the best thing that I’ve ever done. Kyle and I are so touched by these kids that we met. They were so genuine and polite. They were so innocent. Having been told by the principal and her faculty that if we had not come here to provide our services, the kids would not have been able to get glasses was something that I will remember forever. Their parents are so grateful because we have provided a service that seemed so simple to me but would’ve been very stressful and difficult for the parents to obtain. We have not only provided better vision to these kids and their families but have brought to them relief and huge gratitude that will be paid forward. I loved the fact that the kids were wearing their glasses as soon as they received them. During our stay we walked around town and visited the local markets and saw the kids wearing their new frames! As soon as they saw us – their faces were full of smiles and their parents were so grateful and kept thanking us. I loved the experience and am already looking forward to our next 141 Eyewear Clinic.